As a rule, the quarterback and running back are the centerpieces of a high-school football team. Often regarded as the school’s best athletes, they get the statistics and the headlines. 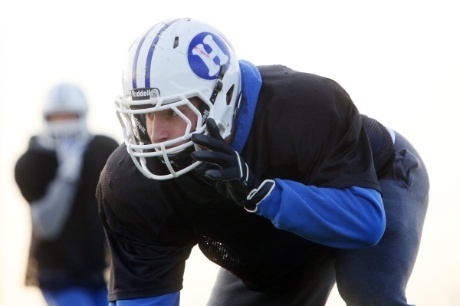 Undefeated Hilliard Davidson has a hierarchy all its own, and Leo is the main man. Leo is a term for the featured hybrid defensive end/outside linebacker. The role demands the physicality, leverage, quickness and explosiveness to outmaneuver tight ends and wreak havoc on opposing quarterbacks and running backs. Anointed as the latest Leo in 2012, senior Alex Backenstoe is the main cog of a Davidson defense allowing just 8.9 points per game entering a Division I regional semifinal against Huber Heights Wayne (11-1) tonight at Upper Arlington. The Central District defensive player of the year in Division I, Backenstoe has 13 sacks and 21 tackles for loss. Dominant in playoff victories over Miamisburg and Pickerington North, the 6-foot-1, 235-pounder will be called on to harass highly touted Wayne quarterback D’Mitrik Trice, who has passed for 2,970 yards and 36 touchdowns. He was named second-team all-district as a junior, helping Davidson reach a fifth straight regional title game. White said he looks for certain qualities in his Leo, and that player usually doubles as a tight end and serves as a blocker in Davidson’s run-based triple-option. Backenstoe inherited a position that Tyler Backstrom, Keith Heitzman and Sam Coles filled adeptly before him. Heitzman is a starter for Michigan. It is no coincidence that the past four Leos have worn jersey No. 2. “Earning that No. 2 is a big motivation for everybody because, not only is it the most important position in our defense, an expectation of leadership comes with it,” Backenstoe said. White’s case for Backenstoe being the team’s most valuable player encompasses the role he plays on offense. Although he has only two receptions in two seasons at tight end, Backenstoe is regarded as a vital and dynamic blocker. Because of his lack of size, Backenstoe is getting attention from only a handful of Division II and III programs, mostly as a linebacker.